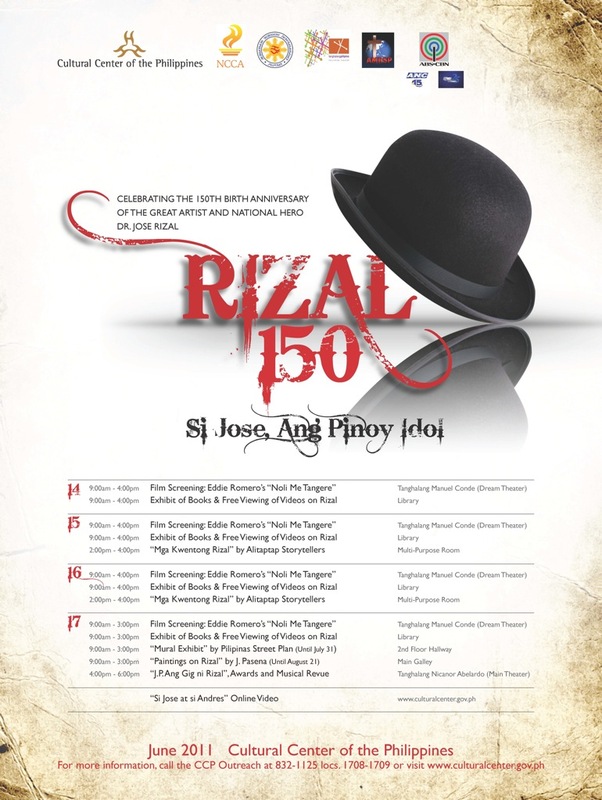 In commemoration of the 150th birth anniversary of the Philippines’ national hero, Dr. Jose Rizal, various activities will be presented at the Cultural Center of the Philippines (CCP) from June 14-17, 2011. The thirteen (13) episodes of CCP’s telemovie Noli Me Tangere by National Artist Eddie Romero will be shown at the CCP Dream Theater from June 14-17, 2011 complemented with lecture-discussions for teachers by prominent resource speakers. "Mga Kwentong Rizal," a storytelling session for children/youth will be held at the CCP Multi-Purpose Hall, while Rizal’s books and videos will be mounted at the CCP Library. 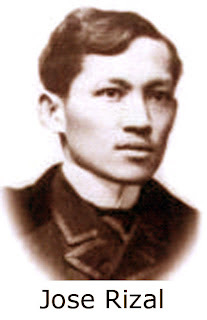 An exhibition of paintings on Rizal by J. Pasena will be on view at the Main Gallery (June 17-August 21). A mural exhibit by Pilipinas Street Plan to be shown at the 2nd floor hallway (June 17-July 31). Malou Jacob’s documentary Si Jose at Si Andres will be made available on line for public viewing thru the CCP website beginning May 27 to June 30. A special program entitled J.P., Ang Gig Ni Rizal will be presented on June 17, 4:00 p.m. at the CCP Main Theater, featuring prominent artists and performing groups led by the Philippine Philharmonic Orchestra under the baton of Maestro Olivier Ochanine, Ballet Philippines’ Candice Adea and JM Cordero, Tanghalang Pilipino, Philippine High School for the Arts, and a 150-voice choir conducted by Jai Sabas Aracama. To be directed by Chris Millado, the performance will also include Rachelle Ann Go, Erik Santos, John Arcilla, Philippine All Stars, soprano Myra Mae Meneses, and Juana Change. Thirty (35) Filipino youth achievers who will be honored as “Mga Makabagong Rizal: Pag-asa ng Bayan” will be introduced during the program. 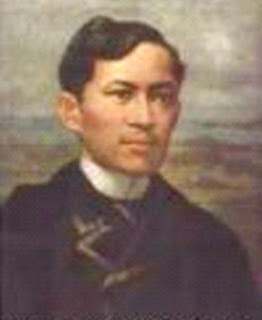 The project is presented by the Cultural Center of the Philippines (CCP) in cooperation with the National Commission for Culture and the Arts (NCCA), National Historical Commission of the Philippines (NHCP), Tanghalang Pilipino (TP), Philippine Center for Gifted Education (PCGE), Association of Major Religious Superiors of the Phils. (AMRSP) and ABS-CBN Broadcasting Corporation. For more information, call the CCP Outreach and Exchange Division at (632) 832-1125 loc. 1708 to 1710 or visit the CCP website.